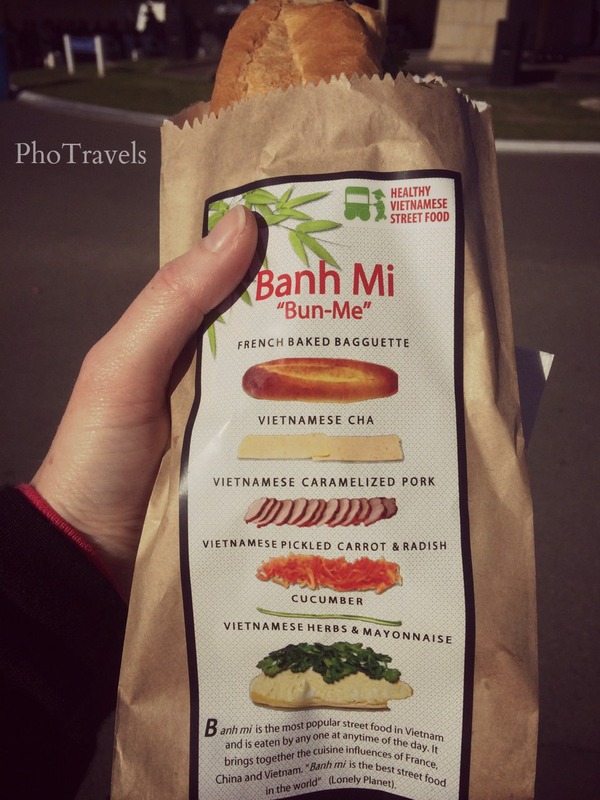 Having grown up eating vegemite sandwiches, banh mi is a treat for the taste buds. This is Vietnamese street food at it’s best – convenient to eat, healthy and delightful to eat. Inside a fresh and crispy baguette, earthy and delicious pate and delicate meats are matched with juicy and crunchy pickled vegetables, and tasty zing is derived from fresh coriander and chilli. Of course, these are just the basic elements, and every banh mi vendor has their own signature ingredients. In New Zealand you’ll only find Vietnamese restaurants in the ‘big’ cities. Our small town is one of many that claims to have Vietnamese food at a local restaurant, but actually doesn’t, and it got closed down recently for a while due to bad hygene – the old ‘diarrhoea dragon’ scenario. Today however, I had the pleasure of trying local Vietnamese street food for the first time. Not only was the banh mi delicious, although not quite as juicy or spicy like those in Viet Nam, but I thought it was marketed very well. Love the packaging! This entry was posted in Street Food, Viet Nam, Vietnam, Vietnamese Cuisine and tagged banh mi, new zealand, Streetfood, travel, Viet Nam, vietnamese, Vietnamese Street Food, Vietnamese Streetfood. Bookmark the permalink. Awh pho would be perfect in winter time in Germany! If you’re ever in Melbourne, you have to try N Lee bakery in Collingwood. Their banh mi are as good as in Vietnam and only 5$. The packaging is adorable! I wonder how long it’ll take perth to catch on? Thank you for your review! 🙂 See you later at our shop. We’ve just posted your link on our FB! Thank you for your review! 🙂 We’ve just shared it on our FB. See you around!!! This has become one if my favorites here! So tasty when you need a quick bite! Awh, thank you. I love lots of things about Viet Nam. You should be very proud of your country. It’s got an amazing food culture. Do you live in VN now? 🙂 I live in New Zealand, but visit Viet Nam regularly. The next trip is in early 2015.